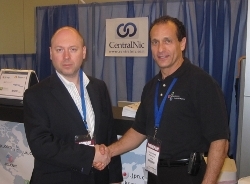 July 19th, 2010: Xelerance Corporation has reached an agreement with domain registry powerhouse CentralNic Ltd to provide European and UK markets with DNSX Secure Signer - the most comprehensive automated signing solution for Domain Name System Security Extensions (DNSSEC) on the market. The agreement means CentralNic's European and UK clients now have local representation and support in implementing DNSSEC management and security policies that have been recommended by the U.S. National Institute of Standards and Technology. CentralNic is one of the world's longest-established domain registries, supplying domain names to an integrated network of 2,000 registrars and 100,000 resellers globally. It will add DNSX Secure Signer to its product line so its clients can easily source the most complete appliance available for automating DNSSEC key generation, key rollover, zone signing and the re-signing processes. An industry leader in stability and security standards, CentralNic embarked on a comprehensive global review of DNSSEC automation solutions over 12 months ago. It was this search that led them to Xelerance, a Canadian company. "From a business point of view it made no sense to tie up valuable in-house resources on these tasks, so we went looking for an automated solution," says Ben Crawford, CEO of CentralNic. "After we selected DNSX Secure Signer, it was a natural choice to extend our support and services to our client base." "We are excited to work with CentralNic," says Xelerance President Sergius Heifa. "As the leading registry services provider for new Top Level Domains with a fifteen-year track record of 100% DNS availability, CentralNic understands the future of the internet and the benefits and management implications associated with DNSSEC." Headquartered in Ottawa, the high-tech capital of Canada, Xelerance provides products and services to secure the internet. Its products include DNSX Secure Signer, which won the Best Security Hardware award at FOSE 2010, and DNSX Secure Resolver. One of the world's leading domain registries, CentralNic supplies domains at an ever-growing number of extensions (including .us.com, .la, .uk.com and .cn.com), including new Top Level Domains due to launch in 2012.